Yes ladies and gentlemen I actually completed a project and yes it "worked"!!! So this was a £5 coffee table of facebook sales pages and a can of blackboard paint. My hansome assistants joined me and sanded the tabletop lil dude was very impressed with this and this was an activity in itself. I'm a firm believer that the extra time and effort spent to let lil dude join in no matter how little the contribution are so worth the effort. His face lights up and he gets to be like mummy and daddy its such a boost to his little confidence. I the masked off the edges and sprayed the top a few times. All the while lil dude kept skipping to the end of the garden to see if "his" table was done. 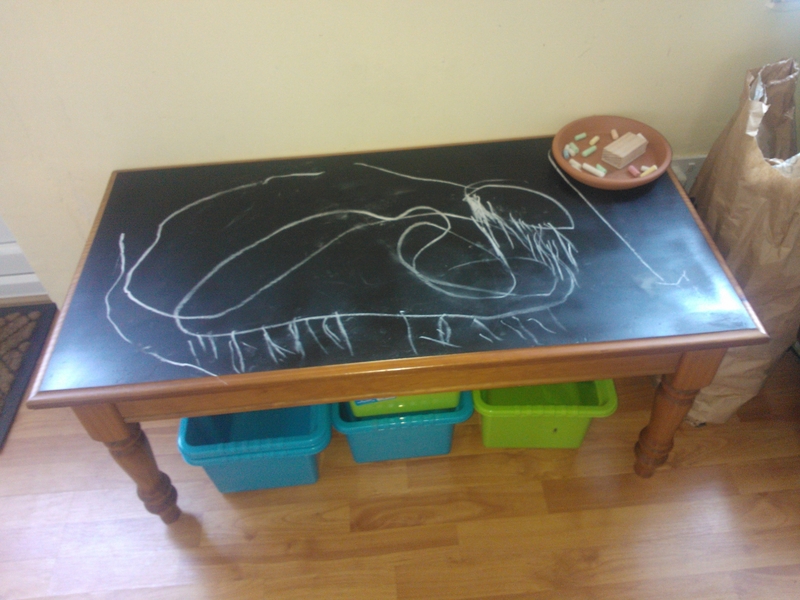 This table has been in the house 2 days and has been used non stop we have had dinosaurs drawn repeatedly (the above is a diplodocus with an apatasaurus i'm told). 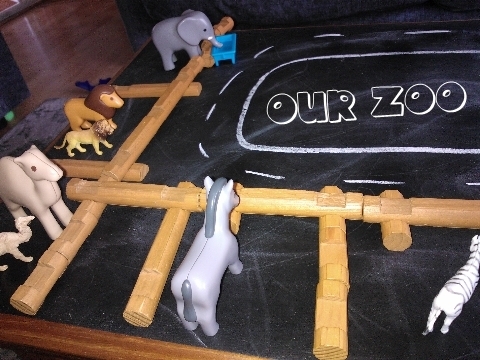 Today I left him to lead the play and he asked for a zoo I gave him his animals and his Lincoln Logs (great great toy) we created cages for the animals once we used all the logs we had to add a road for his tractor which used the chalkboard a treat. The road then (after a lion with an attitude problem cleared the table very loudly lol) turned into a racetrack which then somehow got attacked by dinosaurs and ended in tricereatops racing bmw's and merc's! The day ended in me having to draw dinoland on the table with volcanos, sea and tar pits. I can see this table being a great base for the sensory ideas I have as can be adapted to so much I feel you'll see this one a lot in the future!! !